It’s Christmas week and to be perfectly honest, I’m ready for a lovely family break (only need to find the lovely family now!). The kids are seriously over excited about Christmas and I’m just enjoying their enthusiasm. Their sole disappointment is the lack of snow. All the songs and photos of crisp white Christmases look so beautiful and they want to go sledging. Instead, here in Scotland, it has been non-stop rain for what feels like weeks. It’s very grey and damp. So to cheer me up, and as I haven’t got much work to show you this week, as wrapped presents and homemade fudge doesn’t really count – here are some hopefully inspiring photos of our gorgeous world, chosen totally at random, but all taken on days that were not, to use the Scottish expression, dreich! A Merry Christmas to those of you who are celebrating it and a wonderful 2016 to you all. See you in the New Year! As I mentioned in an earlier blogpost, I had a lovely weekend in the north of England at the end of November. The highlight (in art terms at least!) was visiting the Pauline Burbidge exhibition at The Bowes Museum on its opening day. I don’t think I have ever been to an exhibition where the visitors all spent so long looking at the artwork. Apparently, the normal time a museum visitor spends looking an artwork can be measured in seconds. 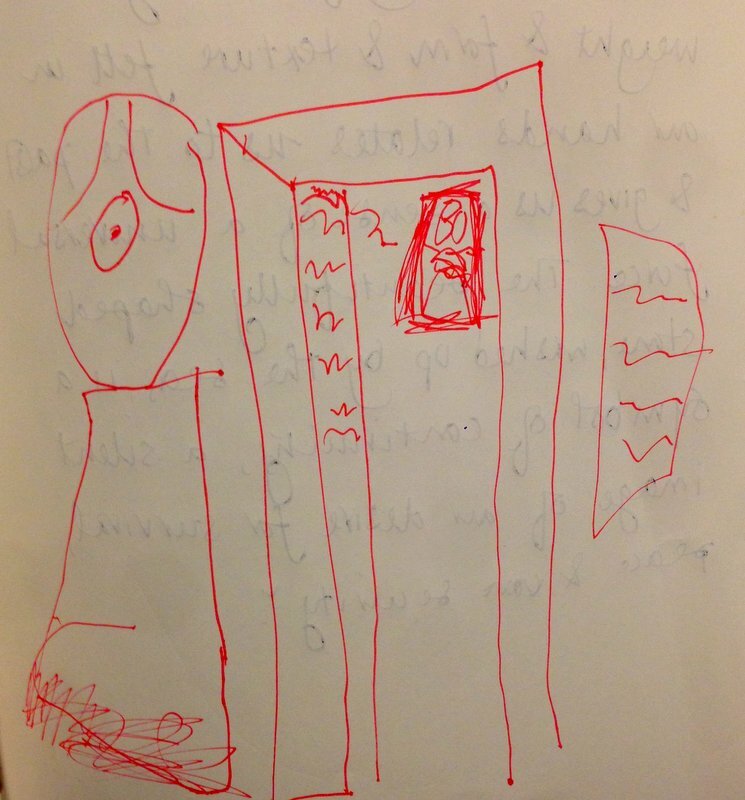 All of the visitors I saw spent several minutes carefully absorbing each artwork on show. 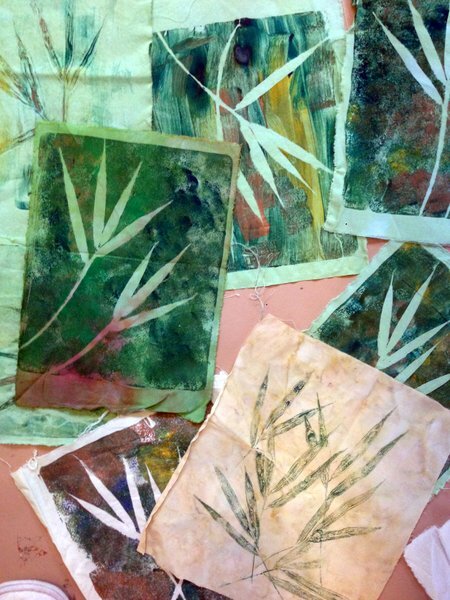 This exhibition is of Pauline’s most recent work. 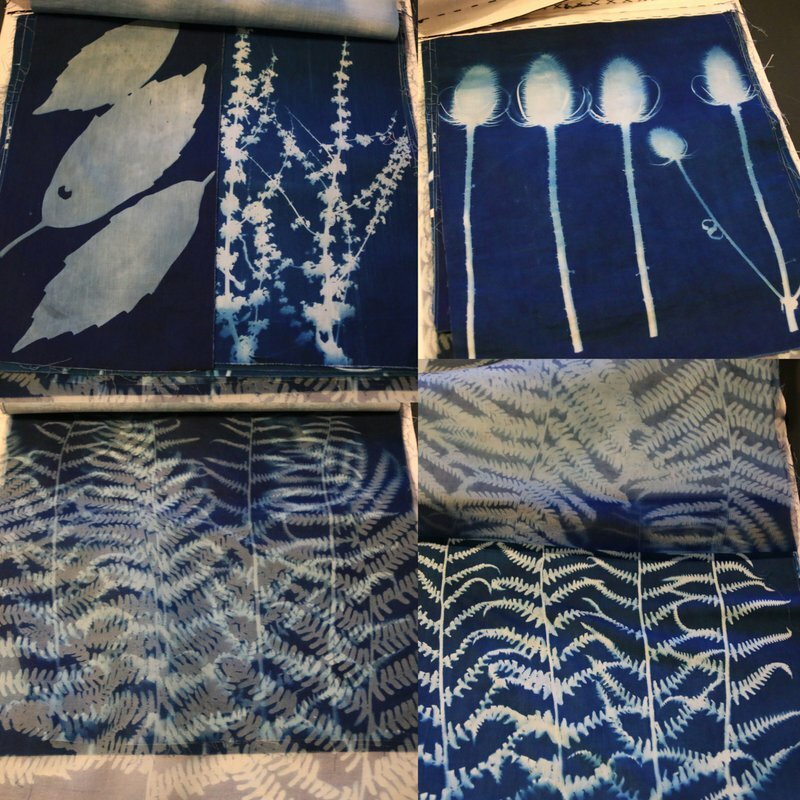 Having moved to working in simple monotone, she now is adding a striking band of colour to her work through the use of cyanotype printing. 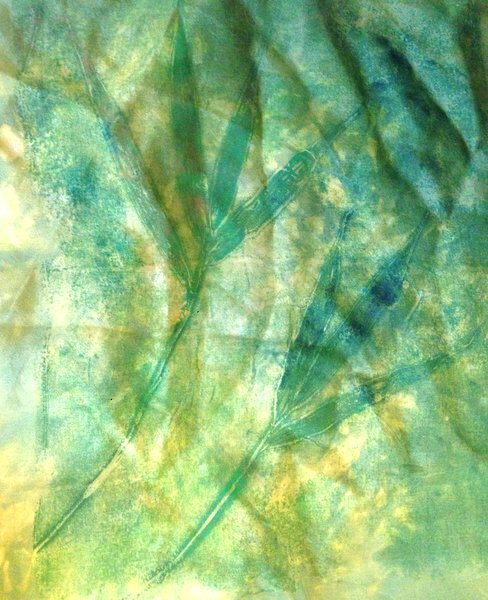 Her subject matter continues to be that of the nature which surrounds her. She doesn’t make work of a recognisable place, more to give you a sense of place. 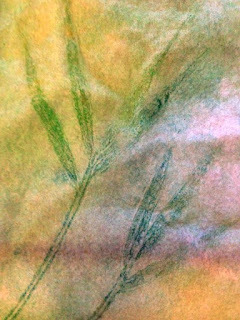 I felt as if I was out in a field, totally surrounded by tall grasses; the wild countryside and high at the top of my vision was a brilliant blue sky. This was pleasurable viewing, especially given how awful the reality of the weather was outside – I had no desire to spend time in the real landscape that day – Pauline’s created one was much more congenial! To make the visit more encompassing for the viewer, there were two videos: one of Pauline’s awesome inspirational photos; the other of her at work in her studio. The visit was also accompanied by specially composed, haunting music. There were her tools, sketchbooks and samples on view – all the things makers want to know about her working processes. It was my first visit to The Bowes Museum and all of us (R and the kids included) really enjoyed it. There was a great kids trail and activities for them to do and we all wished we had had the time to sample the cafe. Starscape by Pauline Burbidge, with added reflections! Pauline’s exhibition was in the Fashion and Textile Gallery, which was worth a visit in itself. 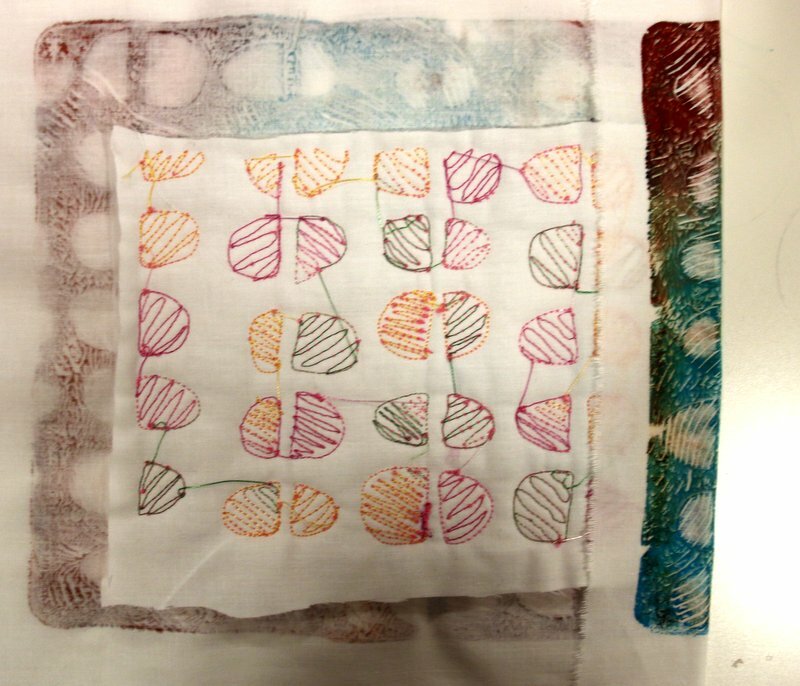 Tantalisingly, to accompany her exhibition, there is a display of quilts in the Glass Cube. They were all overlapped, so you couldn’t see them properly, but apparently if you go as part of a group, you can arrange to gain better access. I’ve written articles about the exhibition for Popular Patchwork and The Quilter, with proper, high quality press images. So you will need to read them if you want to see those photos and to read about my thoughts on the exhibition in depth. These are just some snaps I took on the day. The exhibition is on at The Bowes Museum until April, when it transfers to the Ruthin Craft Centre. I would really recommend a visit. If you are unable to go, there is a lovely catalogue which accompanies the exhibition, which is available directly from the museum shop website for £9.99. 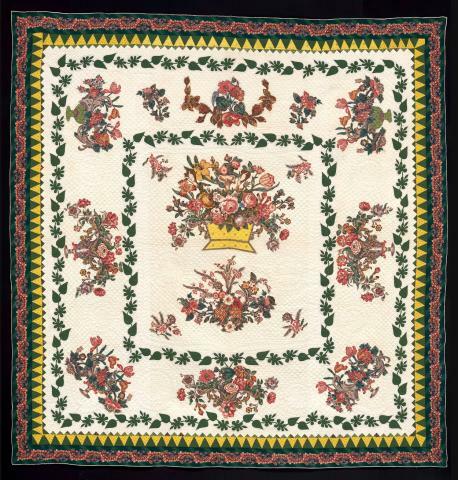 If Santa is being generous, some of Pauline's quilts are also for sale there! 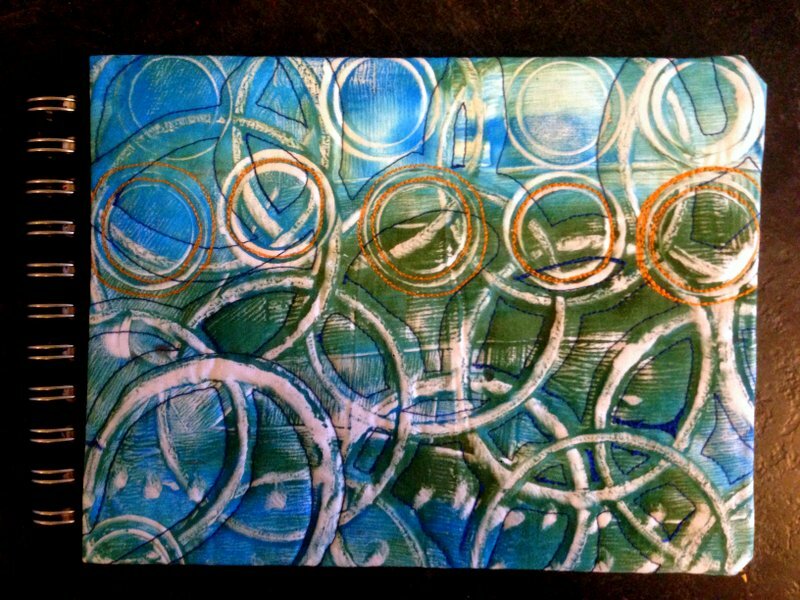 Since I started using a gelli plate a little over a year ago, I have created an awful lot of prints. 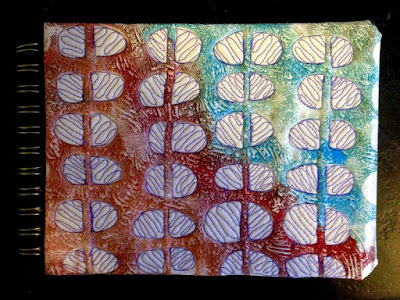 It is a rather addictive method of printing as each time I think of some small variation I can make which might make another interesting print. So I have a lot of prints on paper and fabric. What to do with them all? I have turned some into pictures, mounted ready to be framed, some of which are at the Green Gallery at the moment in its Christmas Show. But that still leaves a lot of prints. Over a number of blog posts, I’m going to share with you some of the other things I’ve made from the prints, starting with turning them into sketchbook covers. I love books of all descriptions and sketchbooks are fabulous due to their potential before they are drawn in and due to containing so many possibilities after they have been filled. Having a pretty cover on the outside is nice, but often when you buy one with a printed cover, the quality of the paper inside is less good. So I’ve bought some blank books, ones with good paper and covered them with a print on fabric to make the front cover more interesting. I took them along to the Primary School Christmas Fayre at the weekend and they generated a lot of interest. 1. Measure the size of the cover (I used mainly A5 landscape books), and cut a piece of medium weight iron-on Vilene and wadding about a 1/4in bigger than you want, if you are going to stitch heavily as it will pull the fabric in. 2. 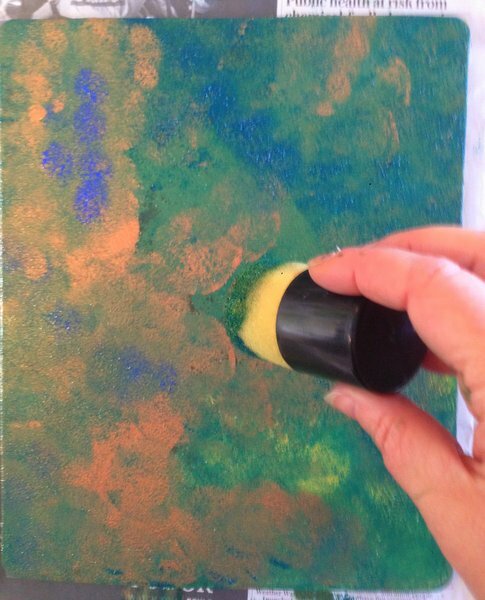 Iron the Vilene onto the back of the wadding and place your fabric gelli plate print on top, making sure it is at least an inch bigger all around. Pin in place. 3. Stitch as you want. 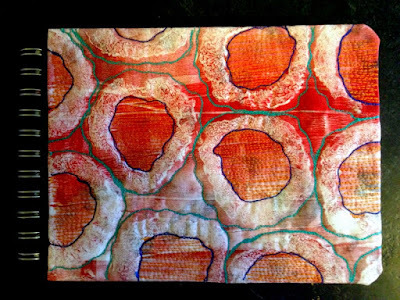 I filled in parts of the pattern and created raised areas by stitching heavily around them to flatten the surrounding parts. 4. Press flat, then wrap the left hand edge round to the back. Press in place for a nice, sharp crease. 5. Glue the flap in place. I use decent PVA glue. 6. 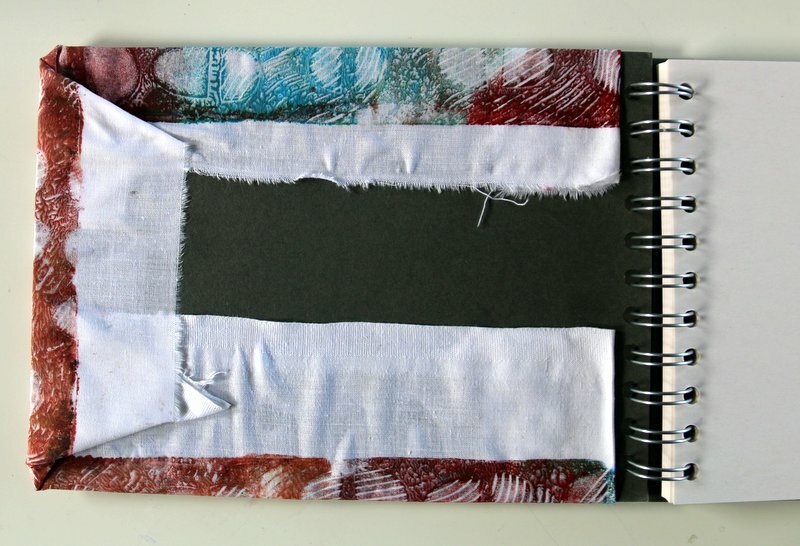 Spread PVA around the edge of the Vilene and the flap, centre on the sketchbook cover and press firmly in place. 7. Open the cover and glue the corners of the fabric over to the inside first, then all the way round, pulling tight as you go. 8. Cover with wax paper (it won’t stick to the glue) and then weight down with books whilst it dries. 9. 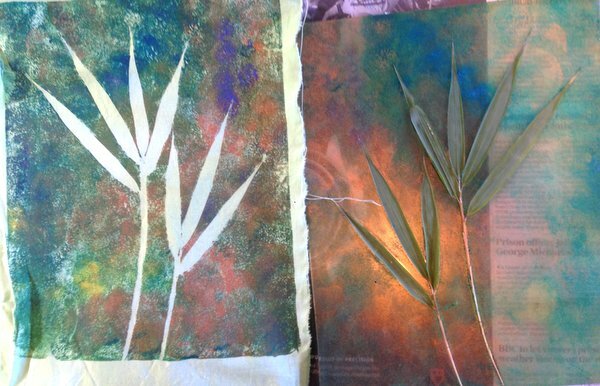 Either glue the first page of the sketchbook over to the inside of the cover or use a paper gelli plate print to hide the edges of the fabric and to give a neater finish. Cover with the wax paper and weight it down again whilst the glue dries. Simple really, but rather effective. 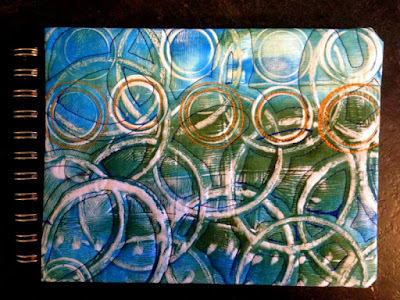 Have you come up with other ways to use gelli plate prints? As the kids had a few days off school so the teachers could be trained, we headed south for the weekend to visit family. This, amazingly, fitted in well with some great exhibitions, and for once, it was a coincidence rather than careful scheming on my part. I’ll be writing more about the Bowes Museum and the Pauline Burbidge exhibition later, which were both fab. They were our first stop on Saturday morning. After lunch, the youngest and I had a lovely afternoon at the Knitting & Stitching Show in Harrogate. She enjoyed the exhibitions and shopped with great determination, given a very limited budget! And yes, I bought some bits too. Sunday, we had an entire family outing to the Hepworth, in Wakefield. We all really enjoyed it from the oldest to the youngest as well as us in-between. The building was amazing and had lovely vistas out over the seriously fast flowing river – we were glad to be inside as the weather outside was foul! 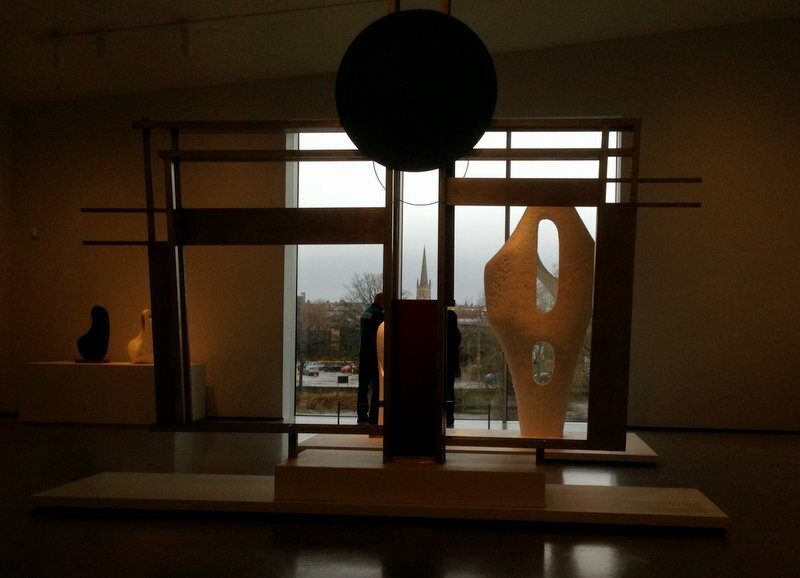 The Gallery has a mixture of Barbara Hepworth sculpture and contemporary art. It also gives an insight into Hepworth’s working methods, including her tools, some technical drawings and lots of maquettes. 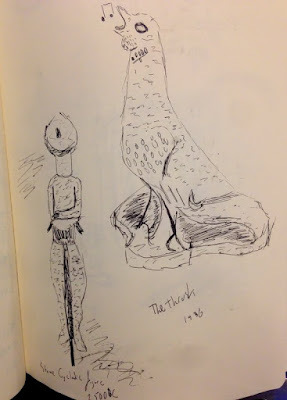 There were some drawers which displayed some of her personal inspirations and I was thrilled to discover a Cycladic figure amongst them – can’t go anywhere without seeing them! The cafe was rather good and there was a fantastic, free family activity pack. 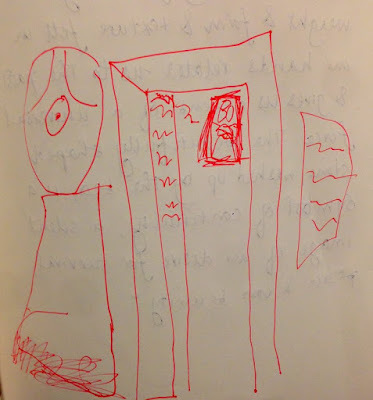 If you are there without kids, I suggest you pretend you have some with you as it was a well thought-out guide to looking at and interpreting the work in a personal manner. and the youngest who is 8. The middle one spent his time photographing, especially making panoramas. This was his favourite - he liked the dark and light in it. Our next family outing to museums will be an exciting trip to London. Any recommendations for family friendly museums? Some of today's prints drying, with added slipper on bottom left! 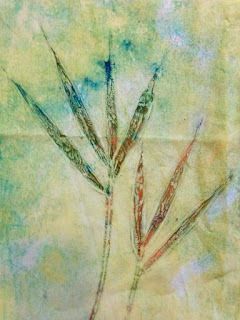 One of my favourite techniques at the moment is gelli-plate printing. I’ve been teaching it a lot recently and whenever I have a spare hour, it is definitely my preferred way of experimenting creatively. 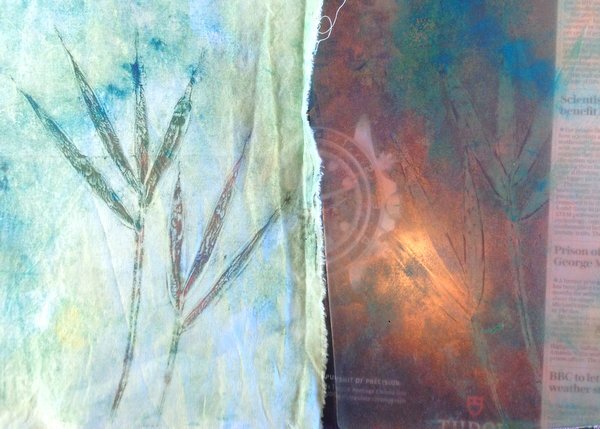 A gelli plate is a soft surface to monoprint on. You can make your own using gelatine, but I prefer to use one made from some kind of silicone made by Gelli Arts. It’s disadvantage is that you don’t control the size, but it doesn’t go off, can be reused endlessly and doesn’t need to be kept in the fridge. Also it is vegetarian. Are you sold yet? They are not cheap, but I think having to keep buying packets of gelatine and other stuff to make one would end up more expensive in the long run. 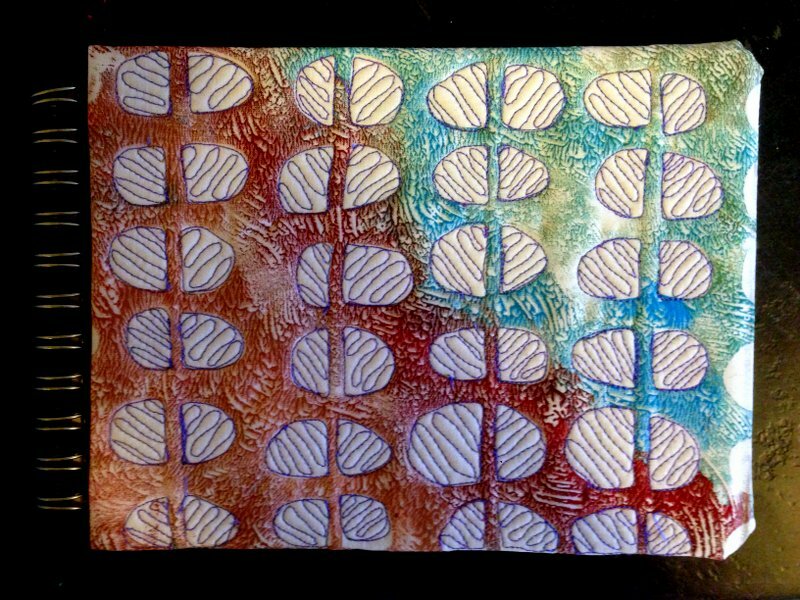 I really enjoy developing work using the gelli plate, using ‘what if’ principles. Generally, the first couple of prints are poor in a session, then I get into it and change the paint colours or the objects I’m mark making with. So far, my favourites are stencils, the plastic netting from orange bags, foam stampers and empty tape rolls. 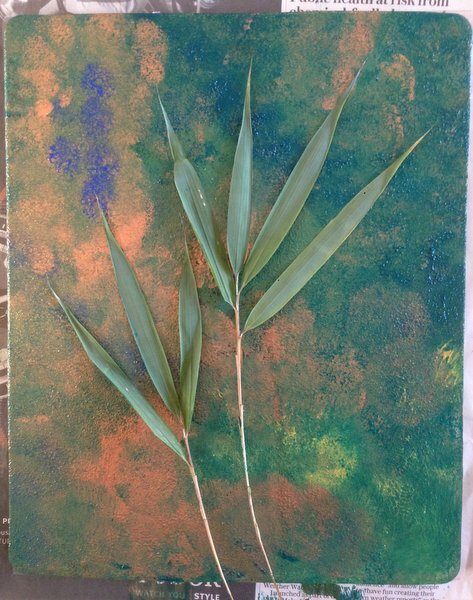 Oh and of course, leaves. 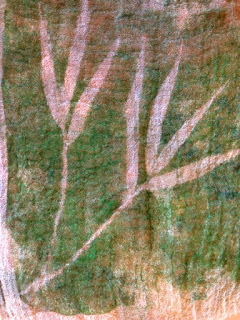 You get fabulous prints from leaves. Today I spent an hour playing with a foam stamper, five colours of paint and two sprigs of bamboo. I mainly printed on hand dyed fabric and got lovely effects on scrim and woollen felt. I wasn’t as convinced by the silk habutai, but I think it was partly due to the background colour rather than the fabric. 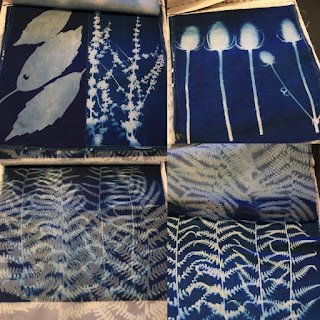 Of course, you get wonderful effects on cotton, which is what I usually use. Generally, the second print is better than the first as it is more delicate. 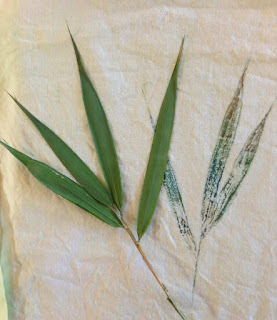 I also was getting a third print from the bamboo leaves themselves, which were gorgeous. 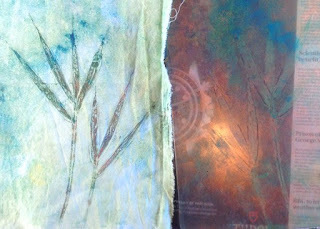 Gelli plate printing also works really well on paper and on Friday 4 December, I have a one day workshop on gelli plate printing and making artists books. There is just one space left if you are interested. The theme is up to you, but it could be a special way of making unique Christmas cards. Now I’ve just got to find time to make something with these fabric bamboo prints! 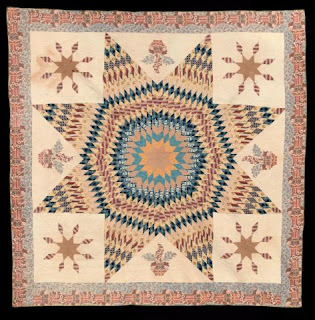 Eye on Elegance was an exhibition of antique quilts at the DAR Museum in Washington DC, USA, this summer. I wish I had been lucky enough to visit as was my friend, Louise Carr. However, I got second best as she kindly gave me a copy of the catalogue. As well as the catalogue and physical show, the DAR Museum has also mounted a big and informative online exhibition of these quilts, which is well worth a look. You can access it here - http://eyeonelegance.dar.org/ . · The quality of the stitching is stunning. 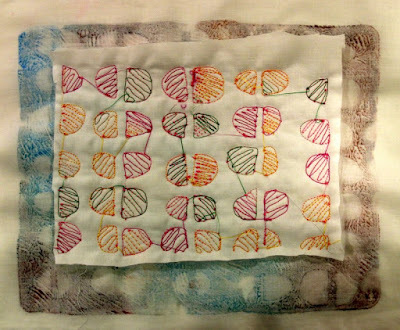 Some of these quilts have up to 12-13 stitches per inch. Reading this made me flick through the catalogue to look at the different standards – even the ‘worst’ has 6-7 stitches per inch. I think I would struggle to draw 12-13 stitches per inch, let alone stitch them! 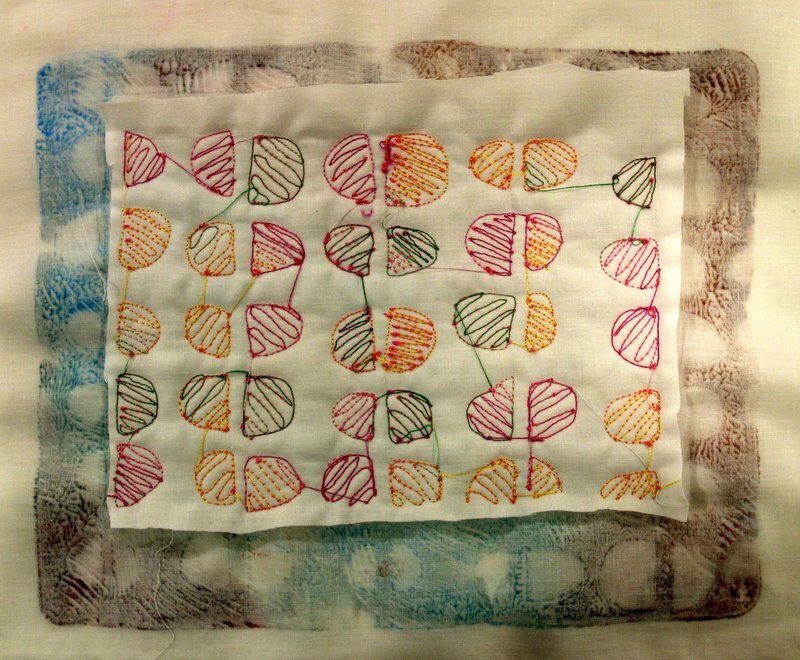 · These are not ‘make-do-and-mend’ quilts. Some of the fabric cost more per metre than a farm hand would earn in a week. I would be terrified to use such expensive fabric now in case I got it wrong. 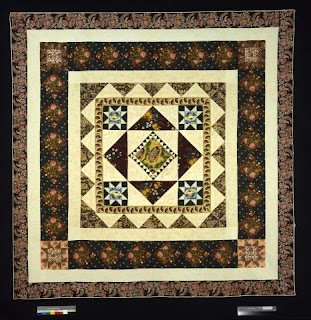 Unsurprisingly, many quilters followed patterns and sometimes it seems you could buy a kit ready basted ready for you to stitch down the appliqué and then quilt. This would still be very time consuming. · The curator makes the point that even when there is one named quilter (and there is much information on their individual lives, which is fascinating), often any woman who could stitch to a high standard living in that household would be commandeered into helping – including servants and slaves. I admit knowing this changed how I looked at some of the quilts. We have this lovely cosy view of a sole maker inviting her friends to a quilting bee to finish off her masterpiece, but how much does this actually reflect reality? Did these woman see stitching as a break from their normal routines, or resent being made to do it? 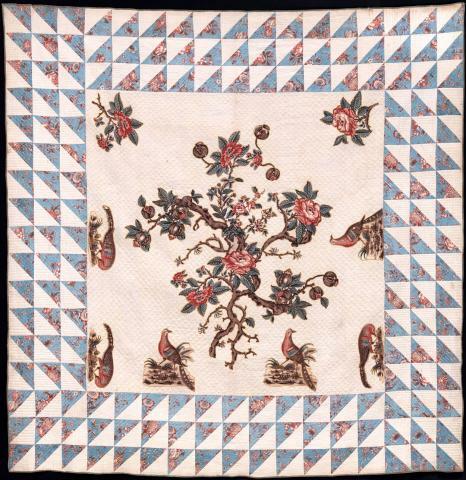 Although these quilts are over 150 years old, it is surprising how relevant they are to today. For example, I was teaching Broderie Perse to my City & Guilds Certificate Group yesterday – it is part of the syllabus. No, none of them were using pieces of chintz that cost over £200 a metre, but it is the same process. And the other month with the Diploma Group, we were looking at borders and their proportions, just like the medallion quilts in this exhibition, which were very popular at that time. 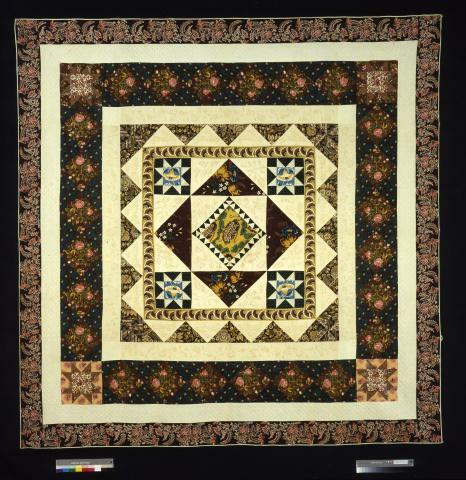 And I love the star design, and was already thinking of making one using paper piecing, even before I saw this book. Actually, I’m trying to dissuade myself due to lack of time and to concentrate on my 4-years-and-counting hexagon paper pieced quilt, which is still going to need another 3 years! If you have the opportunity, I would thoroughly recommend reading the book - the photos are stunning and there are lots of detailed shots - and having a flick through the online exhibition. 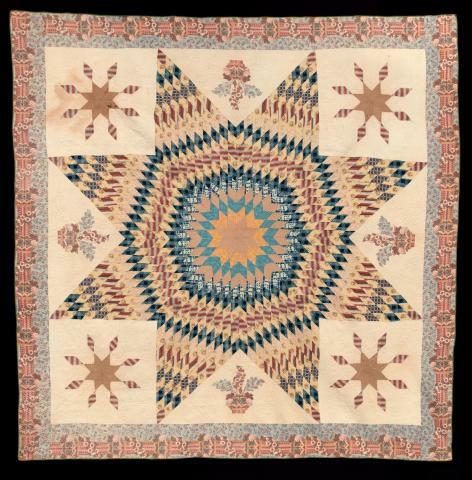 And fingers crossed that one day I can get to see some of these quilts in person. 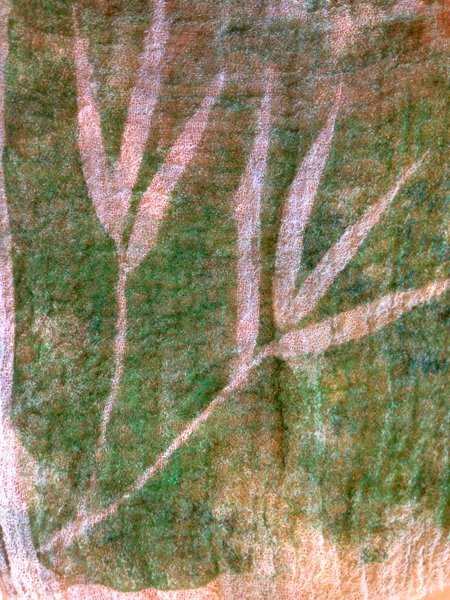 All images used with kind permission from the DAR Museum.